If you want to improve your french, or start to learn it from scratch, you’ll find below a list of the best resources you can use (almost all of them are free!). A podcast in english between a teacher and a student. It’s perfect for beginners: those who already speak french will probably be bored. But it’s a really good way to become familiar with the language and the grammar. It’s the only one of the list that isn’t free (the subscription starts at 10$ per month). Updated on a regular basis, it allows you to follow the news while improving your comprehension skills. Very thorough, one of its strengths is the possibility to adjust the speech rate. That makes it a great option for beginners. The transcription of all the audios is available. This website is really good for everybody, no matter the level you’re at. You’ll find all kinds of dialogues, texts, and lessons. You find all the content both in audio and written form. It’s best to use this website to work on the grammar, because the podcasts are usually french audio courses or dialogues. The official podcast of the RFI ( Radio France Internationale) to learn french. Every day, you’ll find a new 10-minute podcast about hot topics, with the transcription. Perfect for the intermediate and advanced levels. 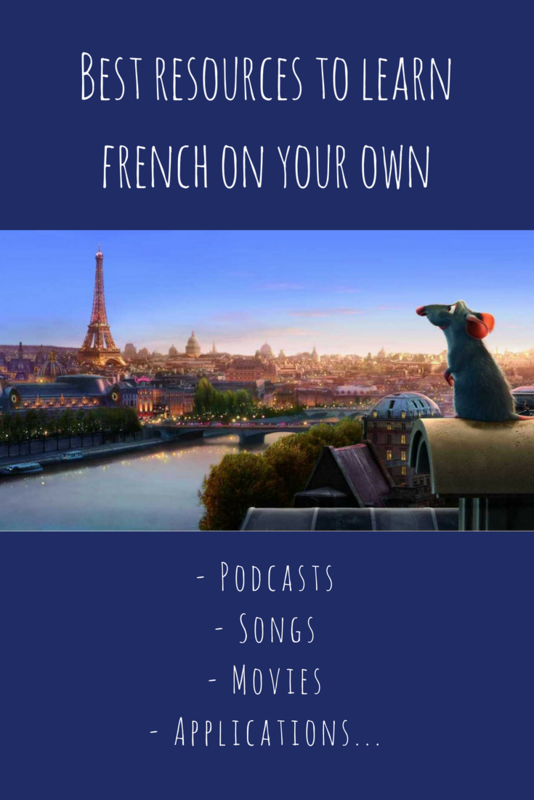 Inner French offers podcasts on various interesting topics – which makes it quite entertaining. You’ll always find the transcription of the audios. It’s good for those that already master the basics of french : you’ll need at least an intermediate level to listen to this one. Sara’h sings french covers of big international hits (Despacito, Avicii, Ed Sheeran…). All of the songs have subtitles. A great way to improve your comprehension while having fun. French classics, like Edith Piaf (L’hymne à l’amour, La vie en rose) , Jacques Brel (Ne me quitte pas, Amsterdam), Charles Aznavour (La bohème, Emmenez moi) or Yves Montand (Sous le ciel de Paris) allow you to discover the french musical culture. And the lyrics are not so difficult to understand. Ortholud is a french exercise website where you can review the french grammar rules. All the exercises are corrected, so you don’t need a teacher to review your work. Français Facile: the interface may seem a bit childish, but you’ll find many interesting stuff, from grammar rules to exercises (with the correction). On Netflix, you’ll find french TV shows with subtitles. We recommand La Mante (crime series), 10% or Marseille (with Gérard Depardieu). Did you know that France has its own “Friends”? It’s avalaible on Youtube (here!) with french subtitles. You wont get to see Central Perk and the whole Ross-and-Rachel drama, but still, it’s worth a look! Audible is a great resource to find audiobooks in french (or in any language, really). You can also find some audio books for free on Youtube, usually for very popular books like Harry Potter. You can listen to the audio while reading if you have a version of the french paperback. E-readers are a great way to obtain french books without having to go to France, or to specialized bookstores. The Netflix catalog isn’t the same depending on your country, so you might have to look for the following movies on other platforms. Le Petit Quotidien is a daily newspaper aiming at french kids from 6 to 10 years olds. You’ll find keywords at the end of each article. Mon Quotidien is also a daily newspaper, but for kids a bit older, from 10 to 13 years old. 1jour1actu (one day one news) is a news sites written for kids. They have an application you can download on your phone. In the category “1jour 1question” (one day one question) you can watch many short videos answering questions asked by kids about the world and the news. Keep in mind that these 3 last resources are made for french kids, and not foreigners who are learning the language. Even though they’re easier to read than the other newspapers, you will need french basics to understand them. Le Gorafi is the french version of the Onion, a satirical newspaper full of very fake and very funny news. 20 minutes is a newspaper that explains daily news in short, summarized articles. It’s a good compromise for those who don’t want to read news sites for kids but don’t feel ready yet to tackle bigger newspapers like the next ones. Le Monde is the most read newspaper of France, along with Le Figaro. Recommended for advanced levels. Le Quotidien is a very popular talk show discussing various hot topics. You can find many french MOOC in MOOC francophone. It’s a great idea for people who have good comprehension skills, because people speak at a normal pace. You’ll find the videos of the courses along with the transcriptions. The most famous ones are probably Duolingo and Babbel. But it seems like everyday, new applications are being born. These apps are good but they can only bring you so far. It’s best to use them in addition to other practices, like listening to podcasts or practicing your oral skills. Anki helps you to create your own flash cards to train your memory. Its an app that is used for memorizing all kind of things, not just languages. The intelligent digital flash cards will help you remember more vocabulary. Forvo is a website where you can listen to the pronunciation of words and expressions. You can also use Google Translation to hear the pronunciation, but Forvo is usually more accurate and gives more context to the words.